Really Real, left, and Bobo, right, in "Roll Call"
Santa Rosa rappers Bobo (Sean McBride) and Really Real (Will Cunningham,) are riding high with their video, “Roll Call,” a tribute to the Super Bowl-bound. In fact, the rappers plan to go to the Super Bowl themselves this Sunday, Feb. 3, in New Orleans. The 49ers’ National Football Conference championship Jan. 20 over the Atlanta Falcons gave a big boast to “Roll Call,” which now has almost 200,000 hits on YouTube. “The song is trending on Twitter under #ROLLCALL as the good luck anthem with fans from all over the world listening to the song,” Bobo said. 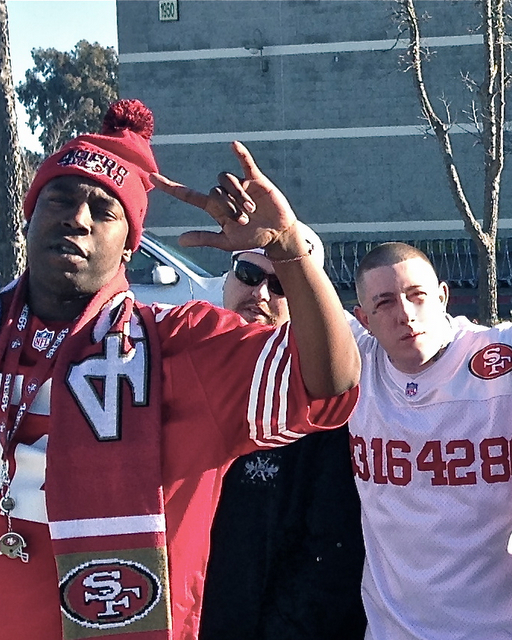 Bobo, Really Real and their crew shot the video at the Candlestick parking lot Dec. 30 during the 49ers victory over the Cardinals. The song was produced by E-A-Ski and mixed and mastered by Sean Chapman. Bobo and Really Real made their 49ers connection through their manager, Leila Steinberg, who worked with rapper Tupac Shakur. Some years back, Steinberg was also San Francisco 49ers linebacker Larry Grant’s babysitter. Steinberg got Bobo and Really Real an invitation to a charity cook-off hosted by Grant, and the two rappers gave the first of the song to some of the 49ers. In return, they got a ot a football signed by the whole team.